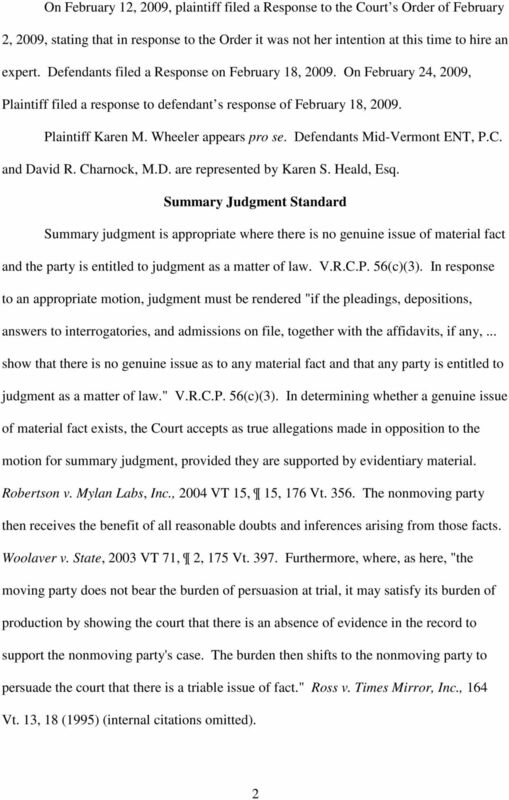 Download "Wheeler v. Mid-Vt. ENT, P.C., No. 657-8-08 Rdcv (Cohen, J., Mar. 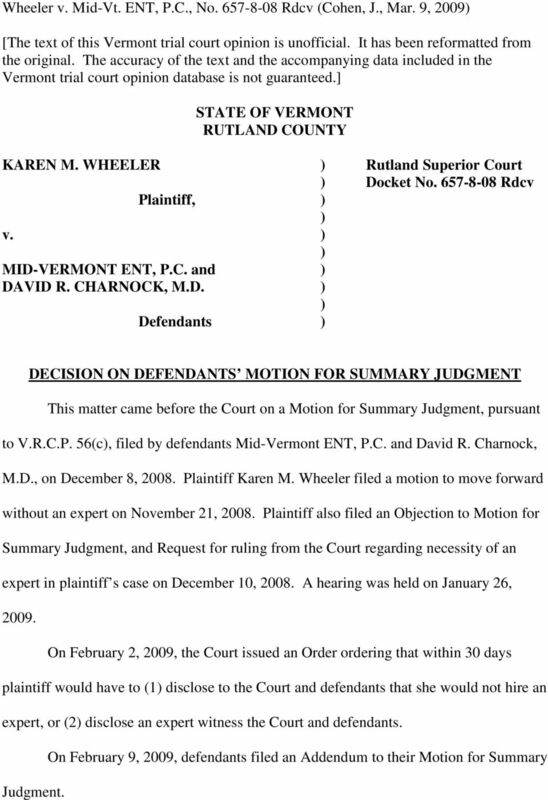 9, 2009)"
1 Wheeler v. Mid-Vt. ENT, P.C., No Rdcv (Cohen, J., Mar. 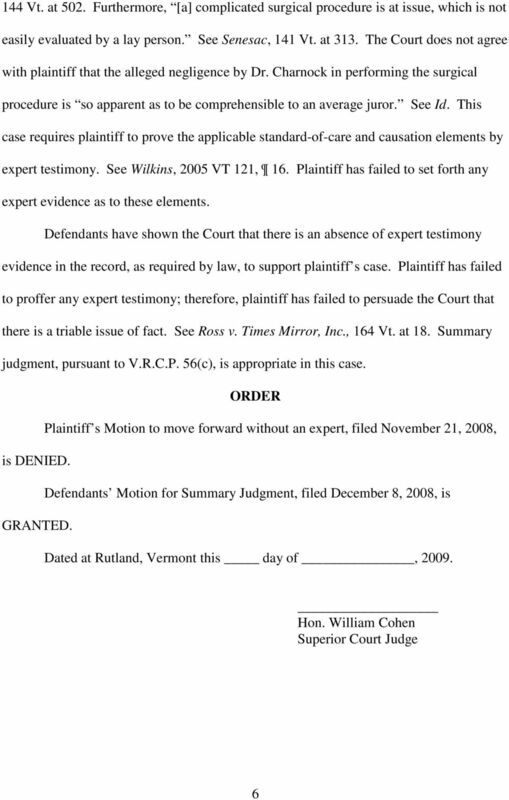 9, 2009) [The text of this Vermont trial court opinion is unofficial. It has been reformatted from the original. The accuracy of the text and the accompanying data included in the Vermont trial court opinion database is not guaranteed.] STATE OF VERMONT RUTLAND COUNTY KAREN M. WHEELER ) Rutland Superior Court ) Docket No Rdcv Plaintiff, ) ) v. ) ) MID-VERMONT ENT, P.C. and ) DAVID R. CHARNOCK, M.D. ) ) Defendants ) DECISION ON DEFENDANTS MOTION FOR SUMMARY JUDGMENT This matter came before the Court on a Motion for Summary Judgment, pursuant to V.R.C.P. 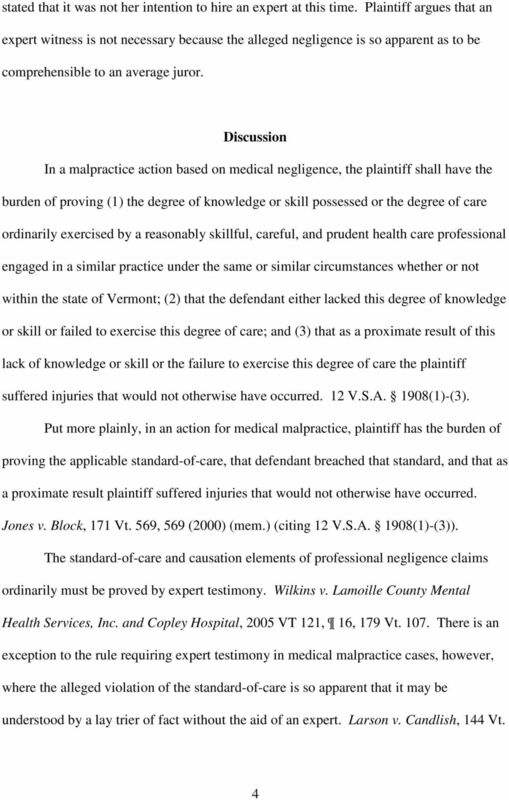 56(c), filed by defendants Mid-Vermont ENT, P.C. 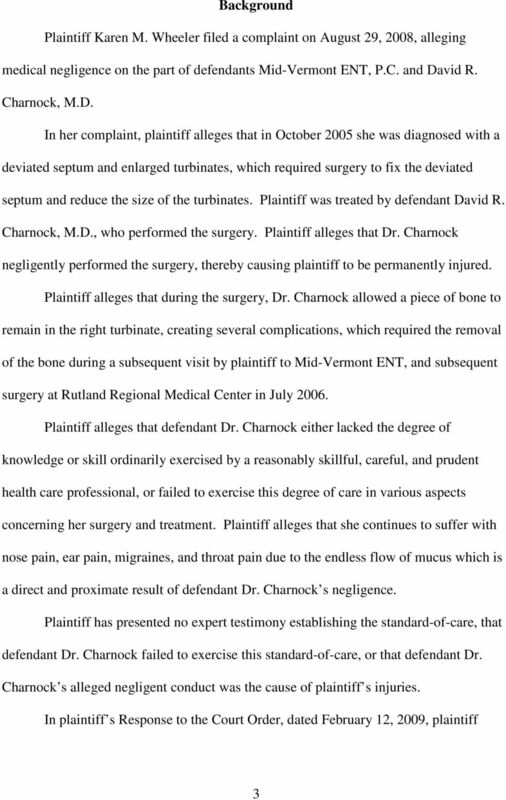 and David R. Charnock, M.D., on December 8, Plaintiff Karen M. Wheeler filed a motion to move forward without an expert on November 21, Plaintiff also filed an Objection to Motion for Summary Judgment, and Request for ruling from the Court regarding necessity of an expert in plaintiff s case on December 10, A hearing was held on January 26, On February 2, 2009, the Court issued an Order ordering that within 30 days plaintiff would have to (1) disclose to the Court and defendants that she would not hire an expert, or (2) disclose an expert witness the Court and defendants. 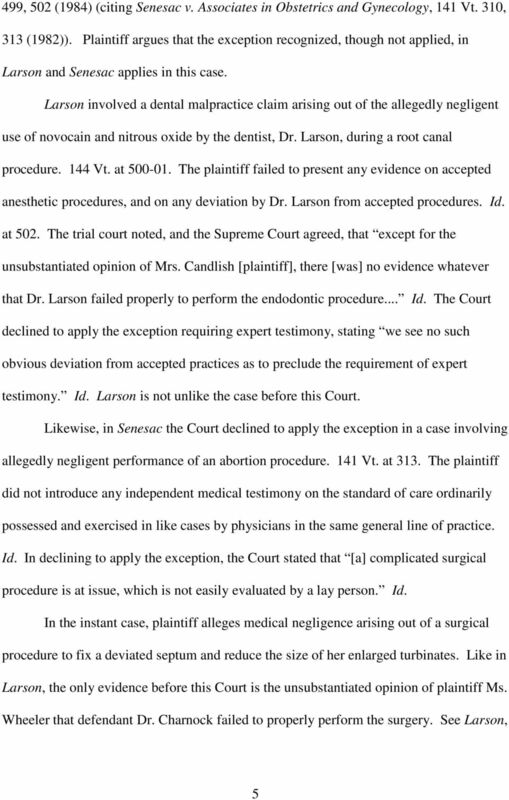 On February 9, 2009, defendants filed an Addendum to their Motion for Summary Judgment. IN THE COURT OF COMMON PLEAS OF PHILADELPHIA COUNTY FIRST JUDICIAL DISTRICT OF PENNSYLVANIA CIVIL TRIAL DIVISION DIAMOND STATE INSURANCE CO., : April Term, 2000 Plaintiff, : v. : No. 0395 : NUFAB CORP.
SHORT FORM ORDER SUPREME COURT STATE OF NEW YORK Present: HON. OHN P. DUNNE ustice TRIAL/IAS, PART 8 MICHAEL CISTNERAS Plaintiff Index No. 1295/01 Motion for summary judge Motion submission: 12/11/03 Seq. COLORADO COURT OF APPEALS Court of Appeals No. : 06CA2332 El Paso County District Court No. 05CV2108 Honorable Kirk S. Samelson, Judge Douglas McDaniels and Barbara McDaniels, Plaintiffs-Appellants, v.
IN THE COURT OF COMMON PLEAS OF PHILADELPHIA COUNTY FIRST JUDICIAL DISTRICT OF PENNSYLVANIA TRIAL DIVISION CIVIL Plaintiff v. COLONY INSURANCE COMPANY JOSEPH ROCCO & SONS d/b/a/ HAYDEN CONSTRUCTION, CO.
UNITED STATES BANKRUPTCY COURT NORTHERN DISTRICT OF GEORGIA ATLANTA DIVISION à IN RE: CASE NO. 05-83912. Plaintiff, v. ADVERSARY NO. UNITED STATES BANKRUPTCY COURT NORTHERN DISTRICT OF GEORGIA ATLANTA DIVISION à IN RE: CASE NO. 05-83912 William Ralph LaFevor, Debtor. à CHAPTER 7 JUDGE MASSEY Ann Woolner, Plaintiff, v. ADVERSARY NO.